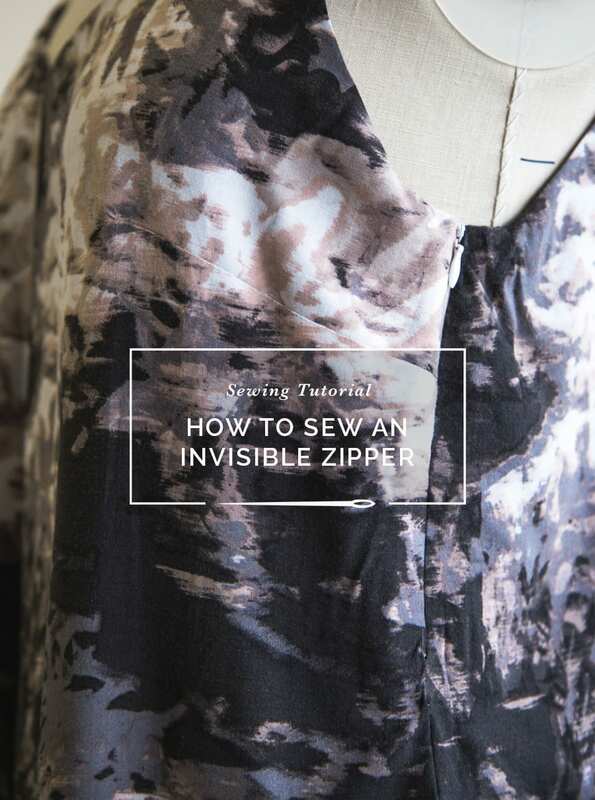 In this sewing tutorial we will be showing you how to install the invisible zipper on the left side, as this is traditional for most ready-to-wear garments. 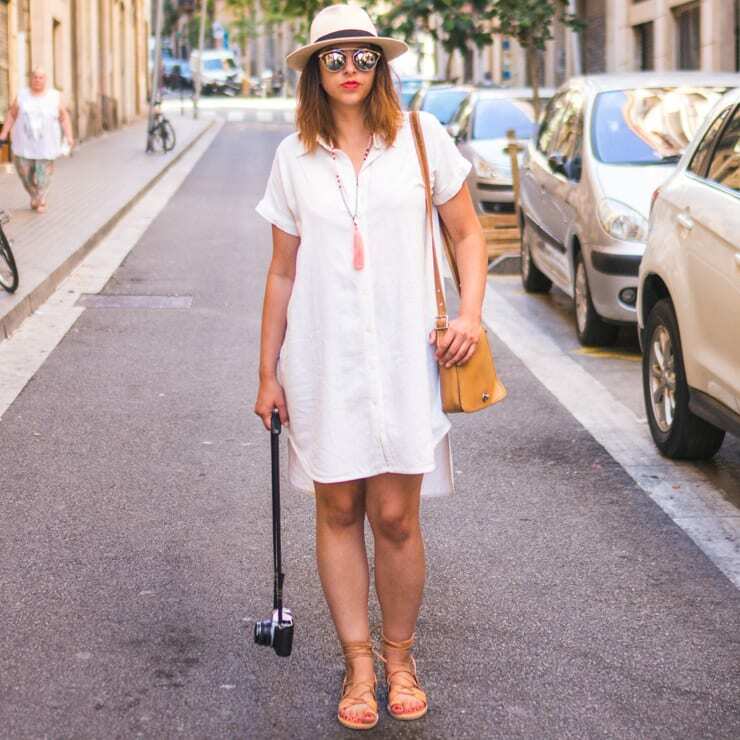 If you’d prefer to open your jumpsuit on the right side, go for it! You can mirror the steps to switch the zipper to the other side. 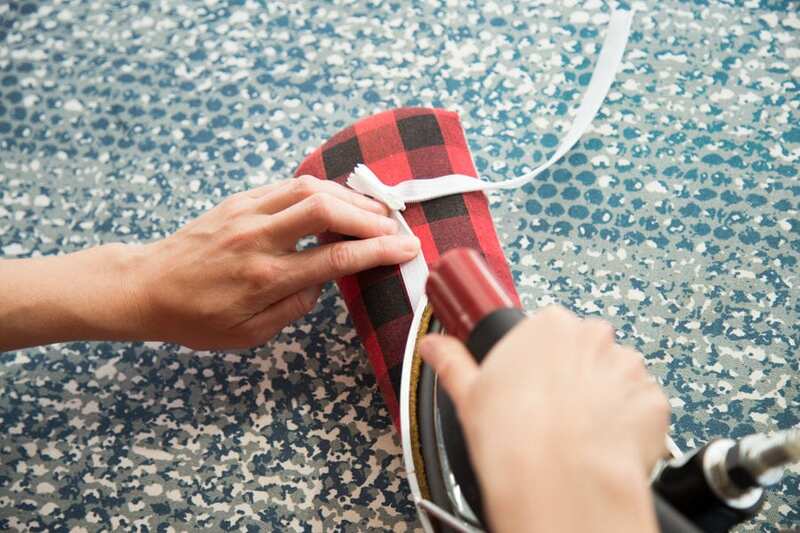 We will also show you how to attach the lining. 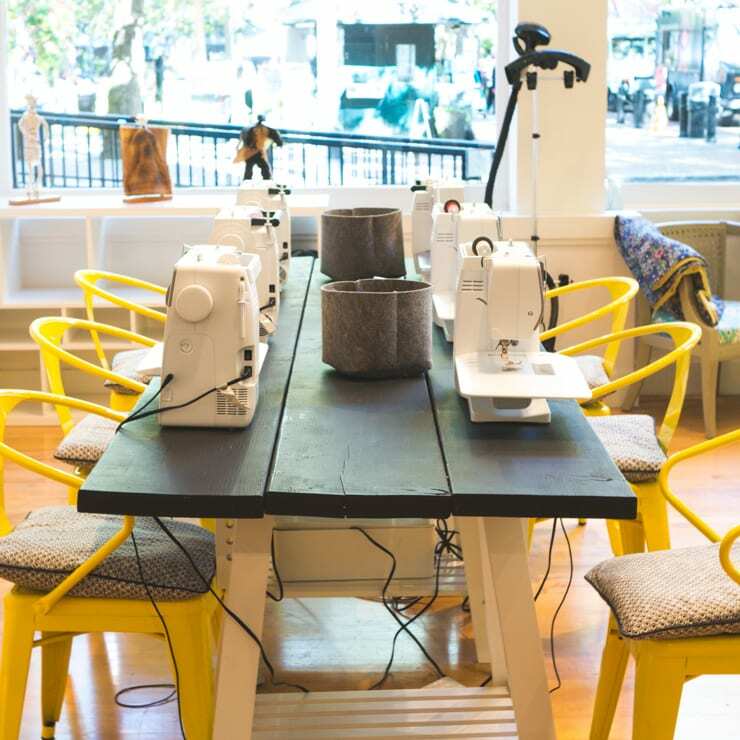 You are ready to install your zipper closure when your front and back pieces are fully assembled: the jumpsuit’s center front and center back seams have been sewn, and your pockets have been attached and understitched in place. 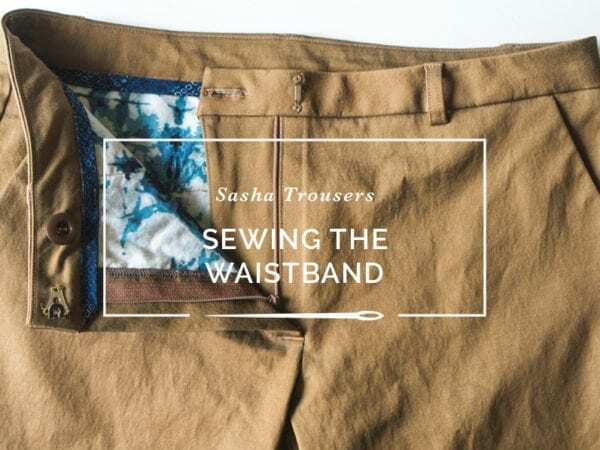 If you are not including pockets, the left side seam allowance for both the front and back jumpsuit needs to be finished separately, using either a serged or zig zag stitch. 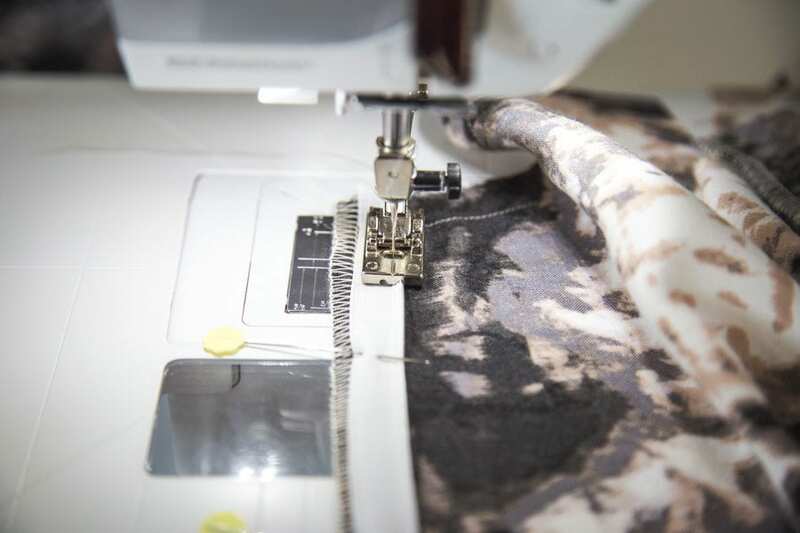 If serging, do not trim the seam allowance where the zipper will be placed. 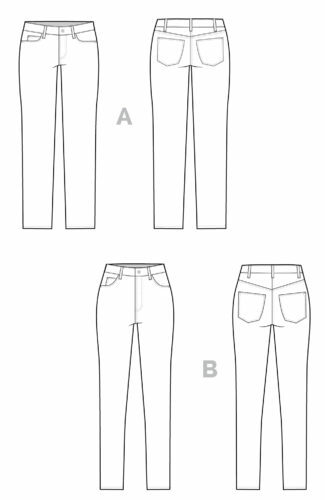 Begin by pressing the left side seam allowances of the front and back pieces in by 5/8″ from the armscye to the zipper notch. 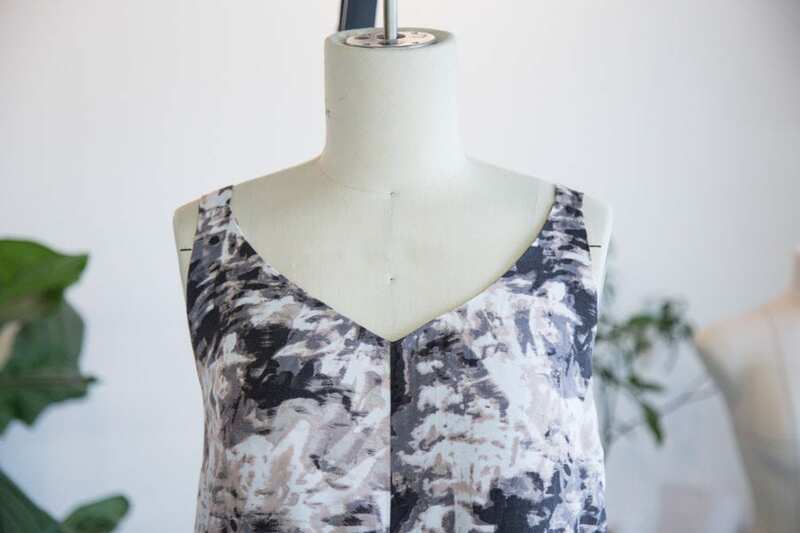 The pressed creases will serve as a guide for your zipper position. 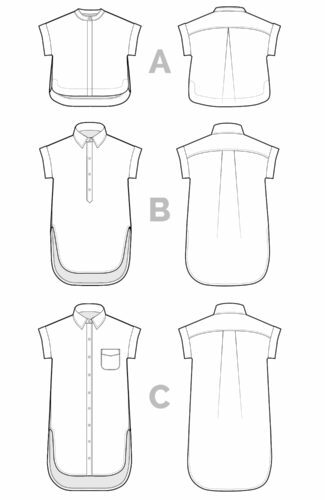 When we refer to the left or right side of the garment, it is always in reference to how it is worn on the body. 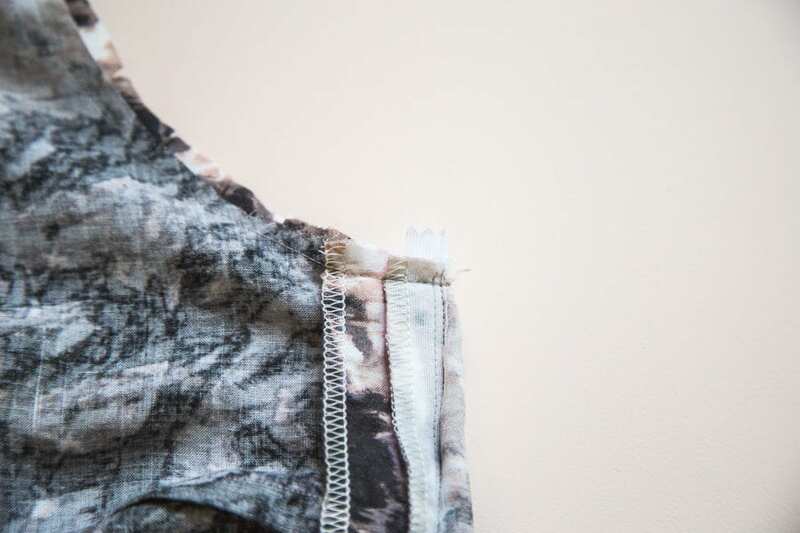 Open your invisible zipper, and press the coils of each side of the zipper flat by pressing them away from the zipper tape with the zipper face down (use low heat so you don’t melt your zip!) 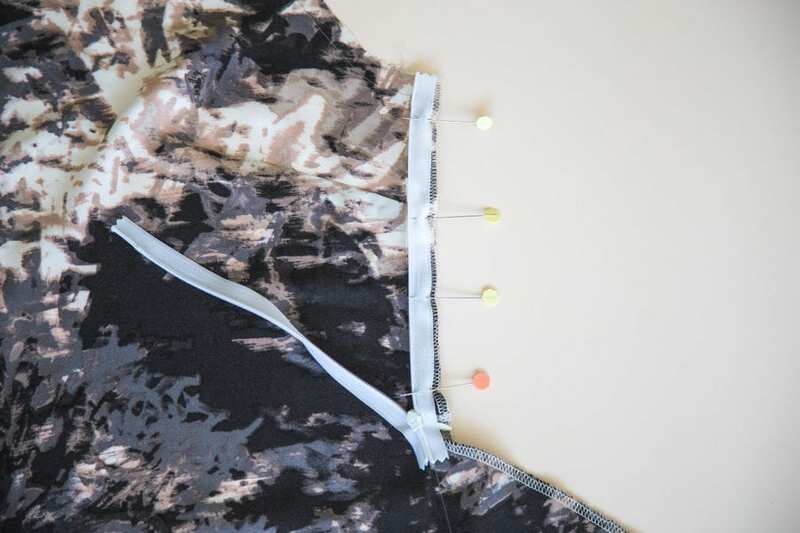 This will help the zipper feed smoothly under the guides of your invisible zipper foot, and will also help ensure correct placement along the side seam so your zipper will be… invisible! Time to sew! 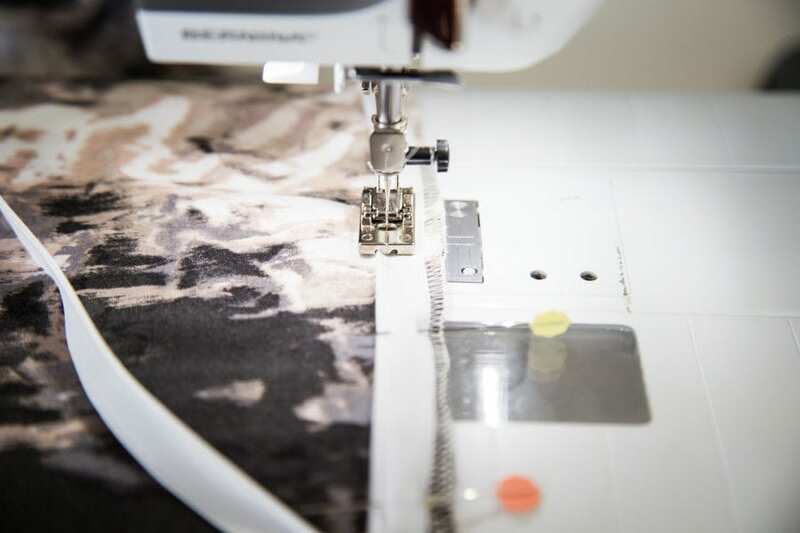 Every sewing machine is a little different, but with our machine, I line the edge of my fabric up with the 5/8″ seam guide on my stitch plate. My needle is in center position, and the zipper coil is under the left hand groove of the invisible zipper foot. Sew from the top of the zipper down as far as you can go, and backstitch at the end. 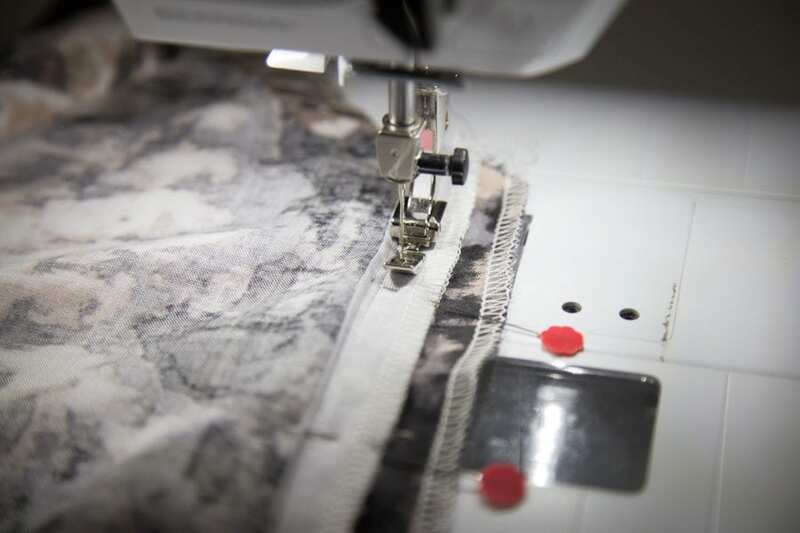 If you do not have an invisible zipper foot for your machine, it’s possible to use a regular zipper foot. Shift your needle as far to the left as it goes, and stitch as close as possible to the zipper coil without catching the teeth in your stitch line. 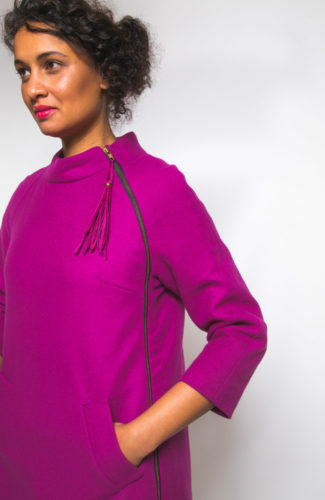 Ensure the zipper matches up evenly on both front and back. 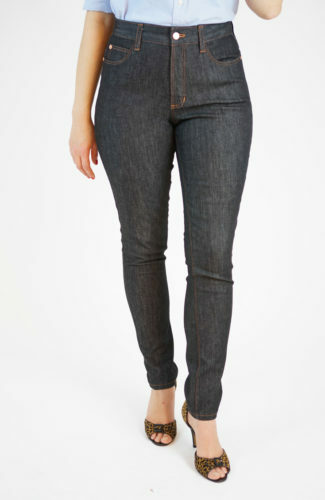 The zipper notches should match on either side. Sew the zipper in place. The zipper coil will be under the right groove of the invisible zipper foot. 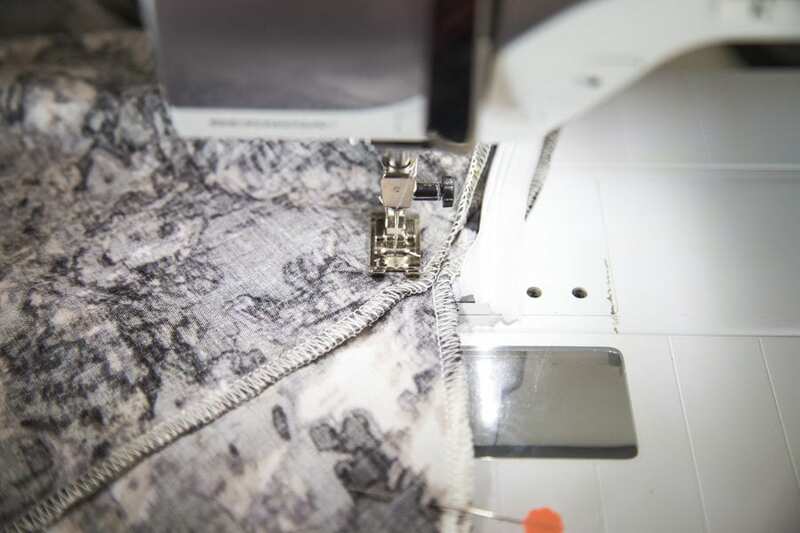 My machine’s stitch plate has seam guides on both left and right sides, so I can line up the edge of my fabric with the 5/8″ seam guide to make sure the zipper is sewn in the correct position. Sew from the top of the zipper down as far as you can. I stopped stitching at the zipper notch on both front and back, so the zipper would be sewn evenly on both sides. Do the zipper up to check both sides match evenly, and that you can slide the zipper pull easily without catching the fabric. Switch to a regular zipper foot, and shift your needle to the right. 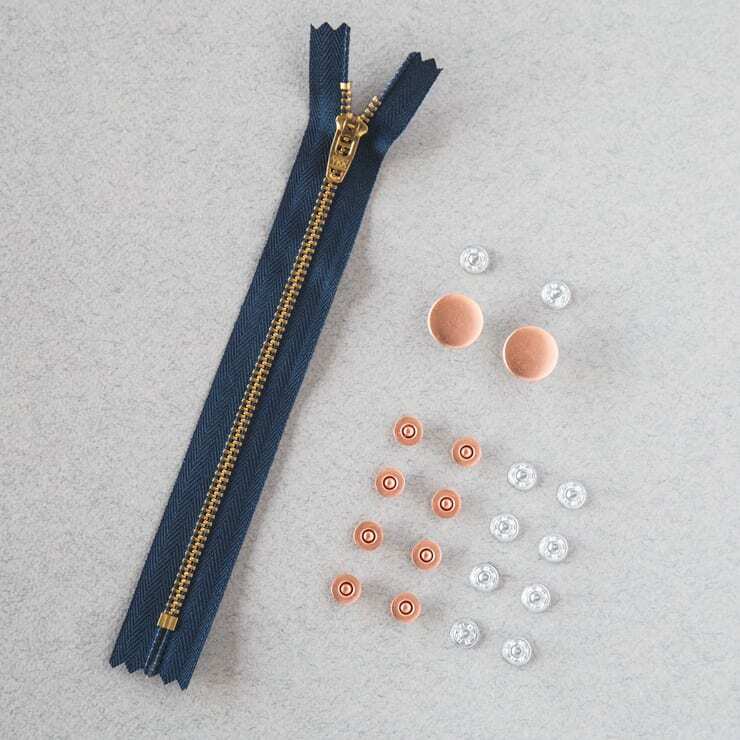 Starting about a 1/2″-3/4″ above the end of where the zipper is attached, sew as close as you can to the existing zipper stitchline for a few inches. 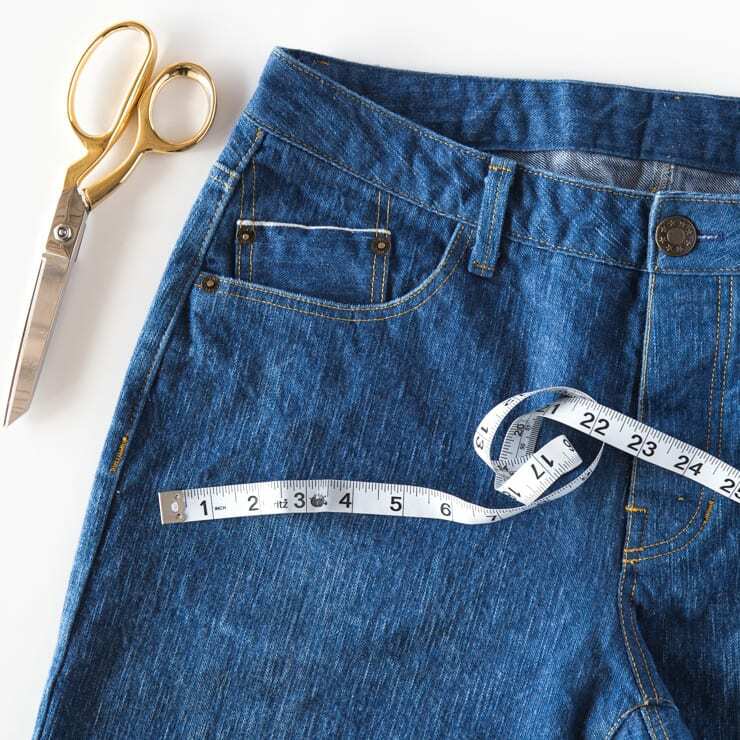 Your new stitchline should be close to the 5/8″ seam allowance. 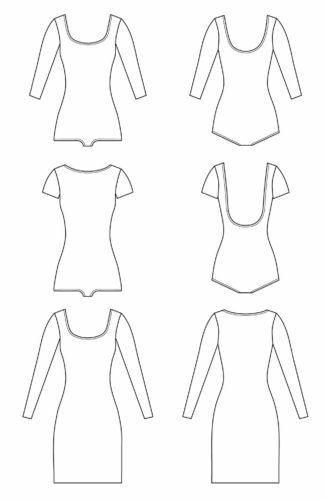 Backstitch at the beginning and end of your sewing. 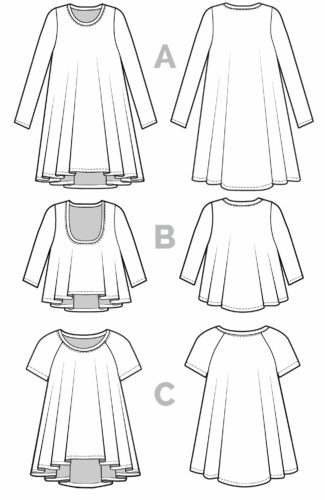 Switch to a regular sewing machine foot, and continue sewing the remainder of the left side seam at 5/8″ seam allowance. Keep your needle down to pivot around the pockets. 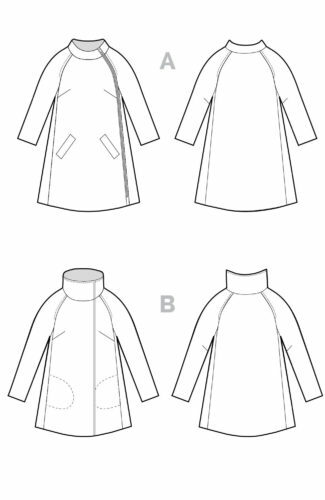 Press the left side seam and pockets to the front from below the zipper to the hem. 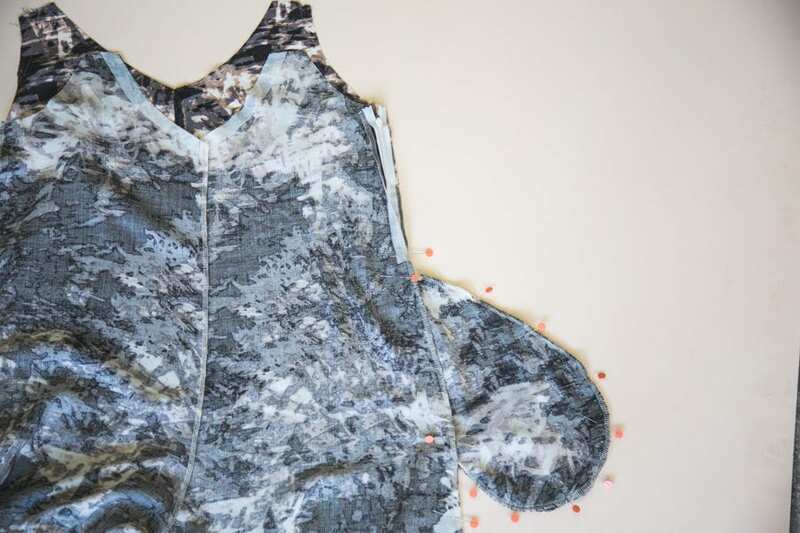 Finish your right side seam and inseam as per the instructions, and we will show you how to attach the lining next! 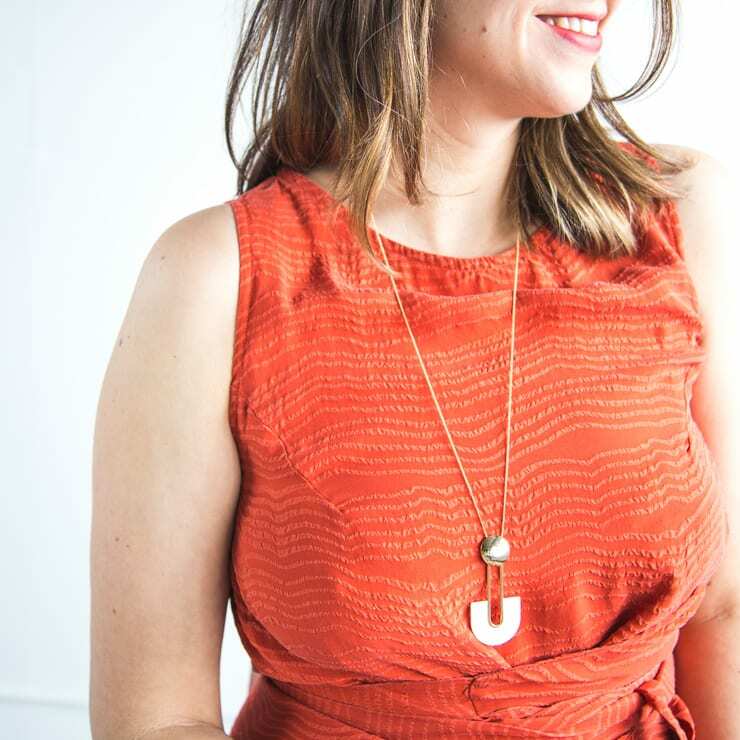 If you haven’t tested the length of your straps, baste them to your jumpsuit now and try it on. Once the length of the straps is confirmed, remove the straps so they don’t get tangled with the lining in the next step. 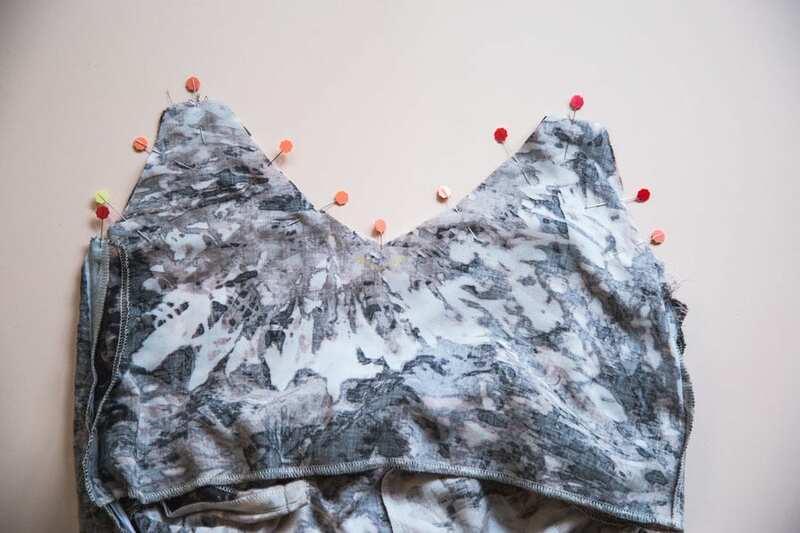 Prepare the bodice lining following the instructions: sew the front darts, pressing them down towards the waistline. 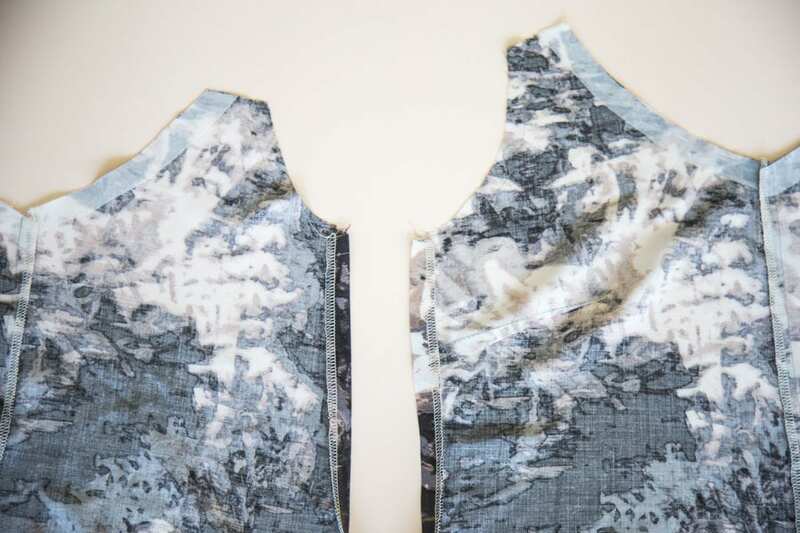 With right sides together, sew the front and back lining pieces together along the right side seam. 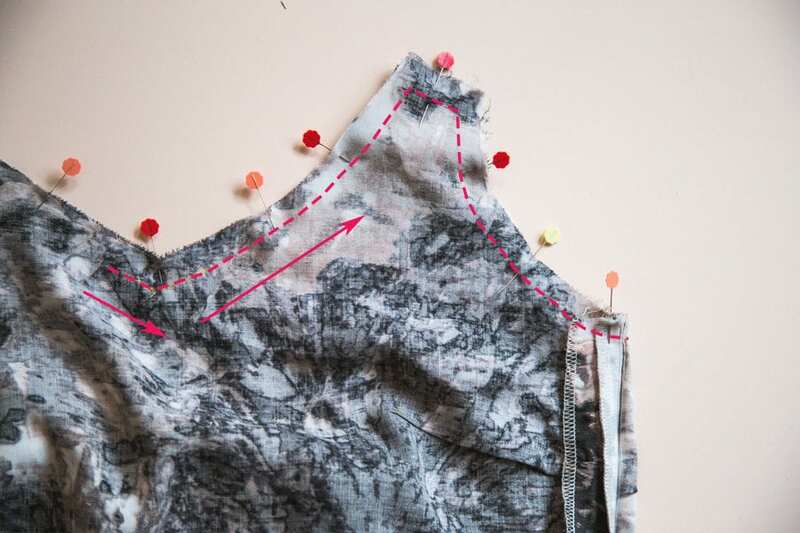 Remember the wrong side of the lining will end up against the wrong side of the jumpsuit, so be mindful of this when you sew this right side seam! 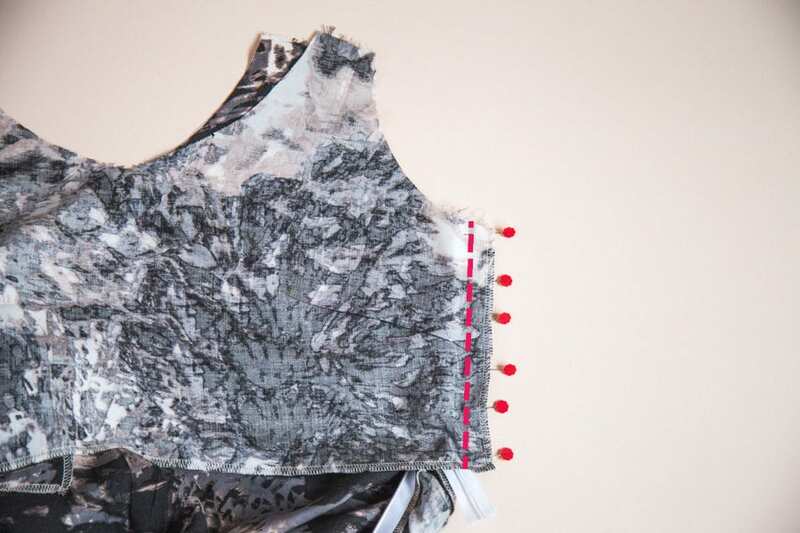 Finish the side seam and press to the back. You will need to finish the bottom raw edge and left seams of the lining piece. We serged around the three sides without trimming any fabric. Open the zipper. 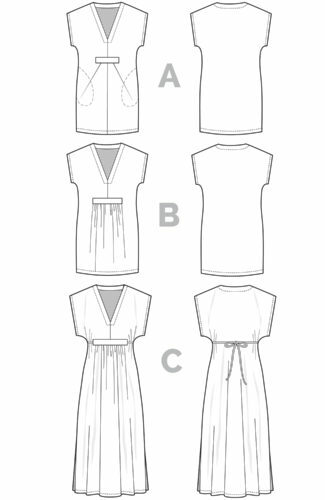 We’ll start by attaching the lining to the left front side seam, so position the jumpsuit front right side up and unfold the seam allowance. 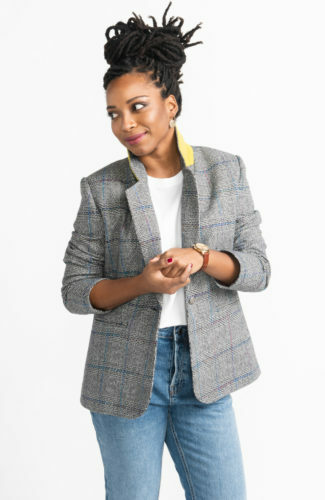 With right sides together, pin the front lining along the left front side seam, extending the edge of the lining past the edge of the jumpsuit by 5/8″. The zipper will be sandwiched between the two layers. This part can be difficult to understand, so here is another visual from the other side. 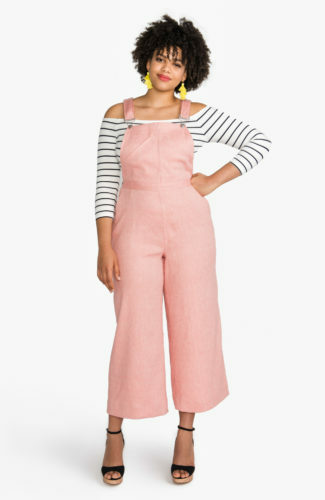 The lining extends past the edge of the jumpsuit front by 5/8″. 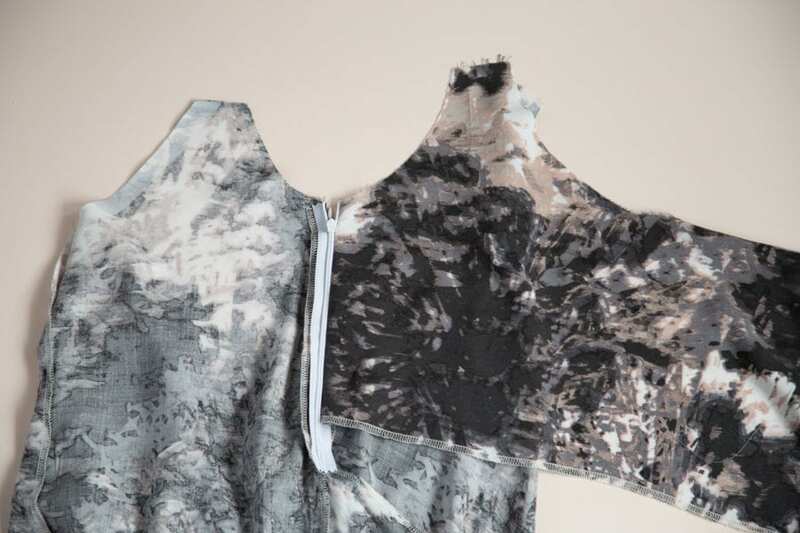 When the lining is pinned to the jumpsuit like this, it is normal that the armscye notches do not line up at this point. Not to worry- everything will line up when the lining is fully attached and the jumpsuit is turned right side out! 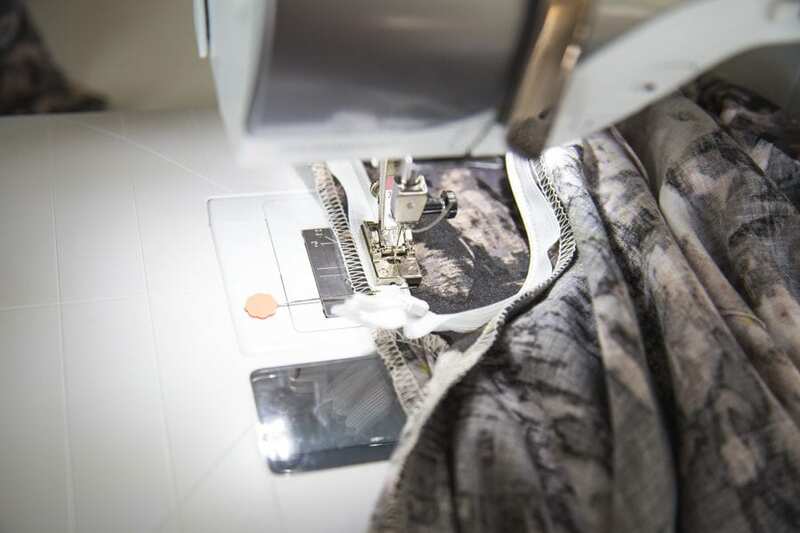 Using a regular zipper foot, shift your needle to the far right and sew the lining to the jumpsuit using the original zipper stitchline as a guide. Sew just inside the original stitching. The front side of the zipper is now neatly encased inside the lining. Do the zipper up to make sure the zipper pull still slides freely without catching the lining. 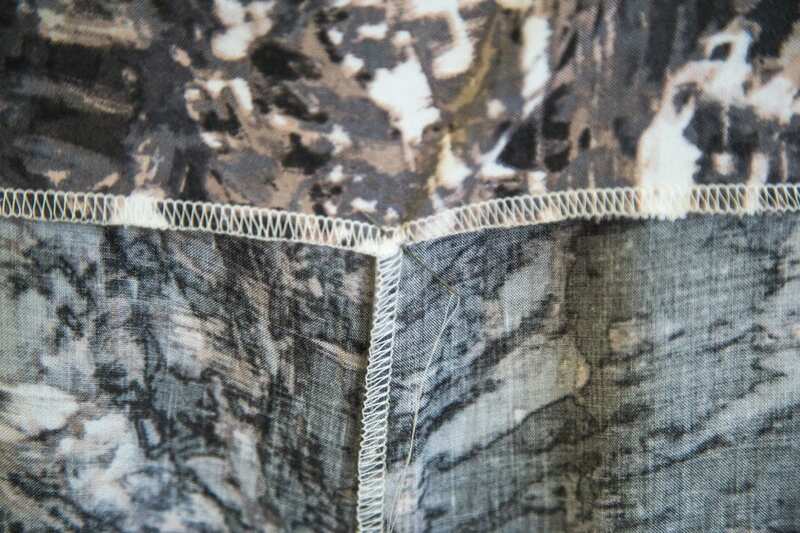 Open the zipper and match the lining to the jumpsuit with right sides together. 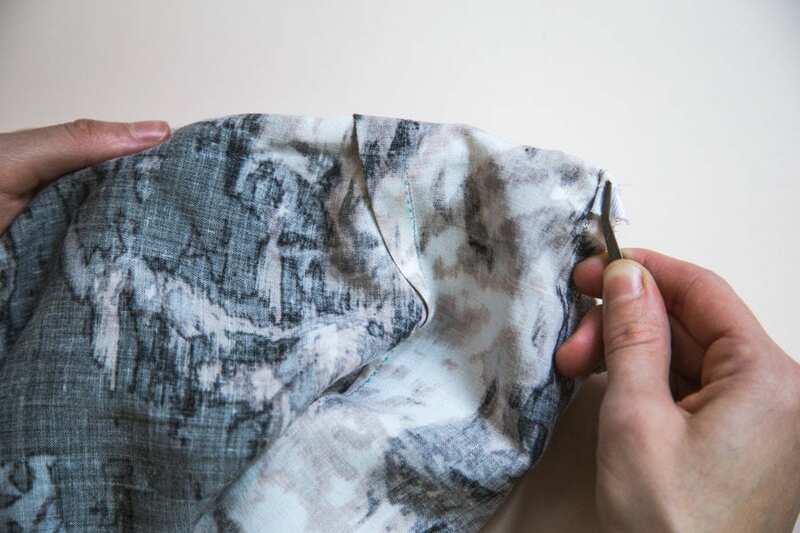 Pin the other side of the lining to the left back side seam, again extending the edge of the lining past the edge of the jumpsuit by 5/8″. 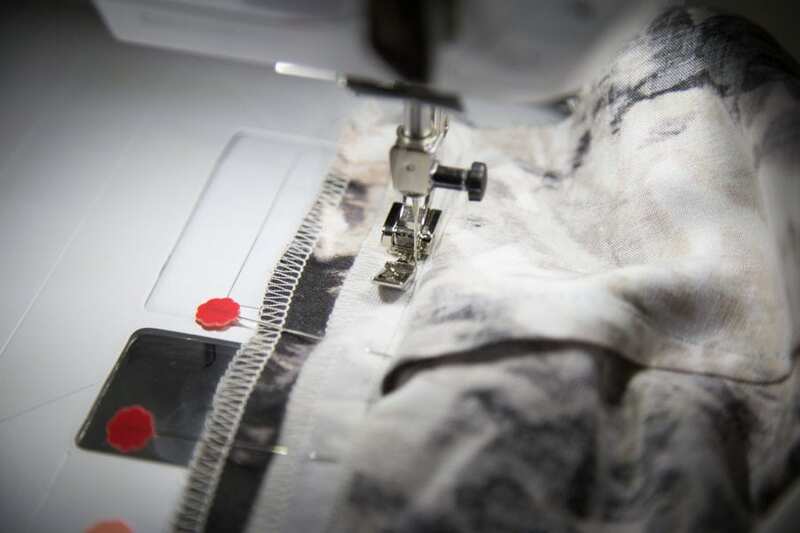 Shift your needle to the far left and stitch the lining to the jumpsuit just inside the original zipper stitchline. 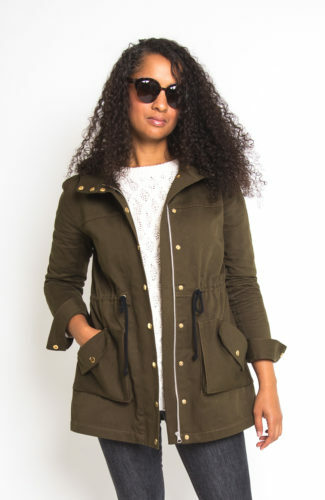 When you turn the lining and jumpsuit right side out, the zipper is fully enclosed. 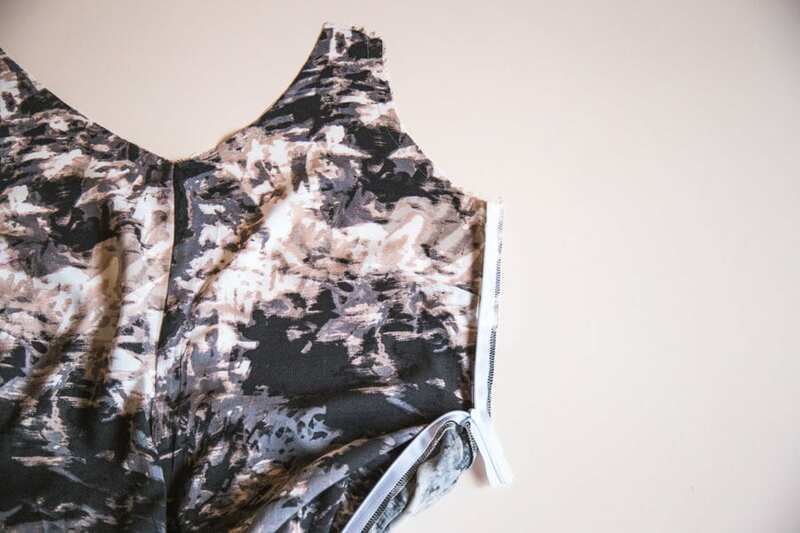 The next step is to attach the straps and secure the lining to the jumpsuit along the neckline. 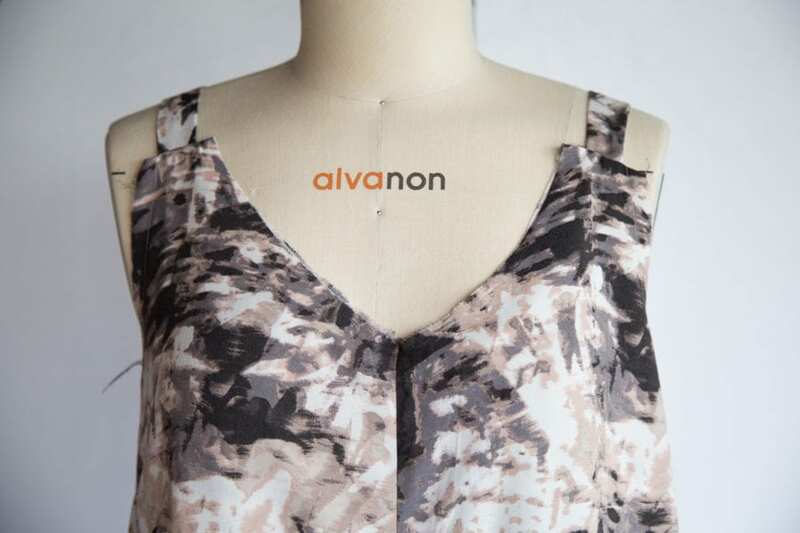 You can sew the neckline in one pass if you like, but we find the pinned straps can easily tangle or pull your work, so it may be easier to sew in stages. 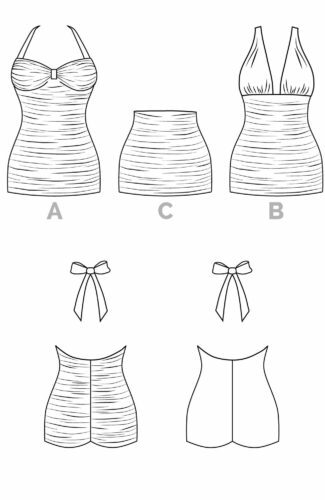 Sewing the V neckline in stages as we’re about to show you will also help prevent this point from stretching out or gaping. Baste one end of each strap in place along the jumpsuit front. 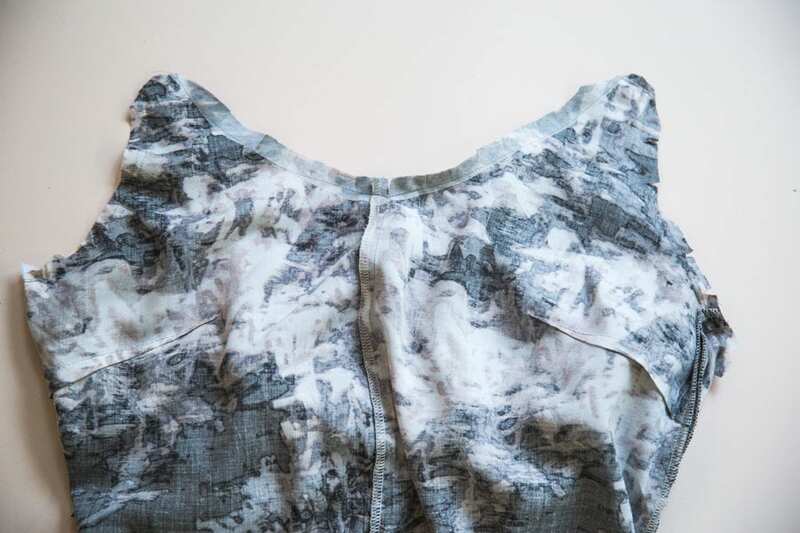 Turn everything wrong side out and pin the lining to the jumpsuit along the front neckline and armscyes. 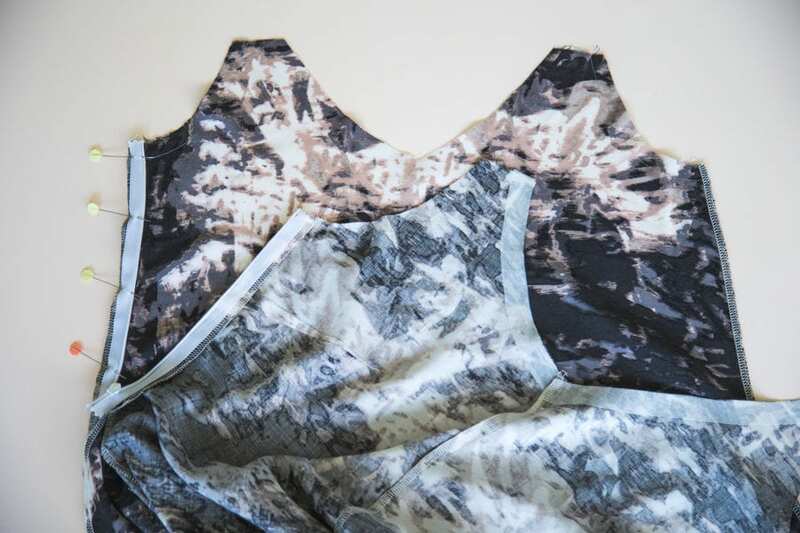 The straps will be sandwiched between the jumpsuit and front lining. At the side seam where the zipper is, roll the seam allowance around the zipper towards the lining. 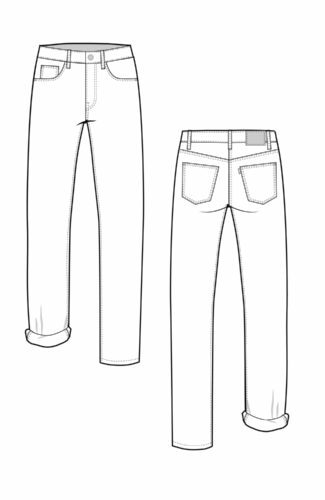 This will pull the lining and jumpsuit so the armscye notches are aligned properly. In the photo below, the armscye notch is indicated by the yellow pin. You can draw in a helpful stitching guideline at the V point with a removable marking tool, as we’ve done with yellow chalk. Starting an inch from the opposite of the V point, stitch around the V, keeping your needle down to pivot. Sew up around the strap and down the armscye to the zipper. 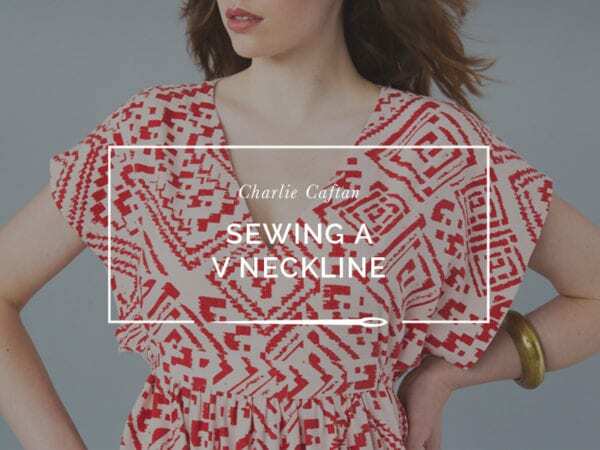 Sew the other side of the front neckline, overlapping the stitching on the other side of the V point. 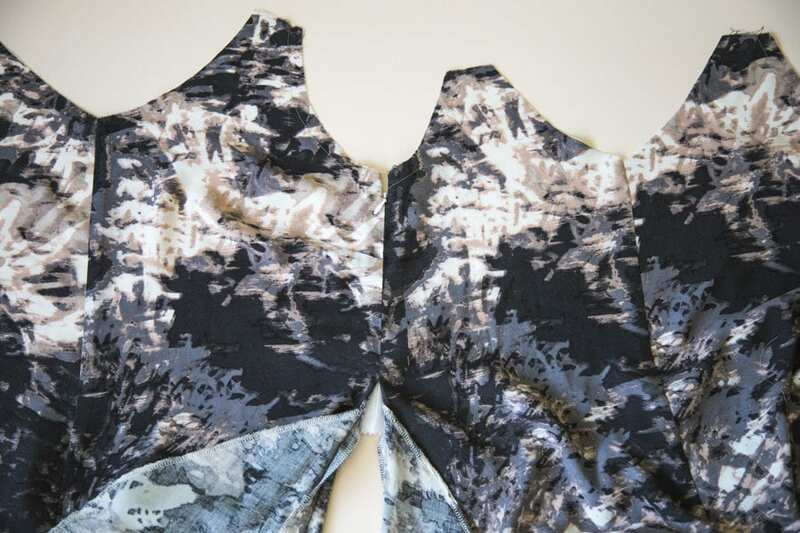 Ensure the right side seams of both the jumpsuit and lining are aligned. 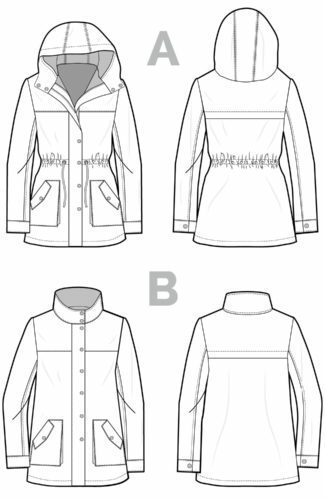 Stop stitching at or just past the right side seam. If the opposite ends of your straps are not yet basted to the back of the jumpsuit, do so now, ensuring they are not tangled. 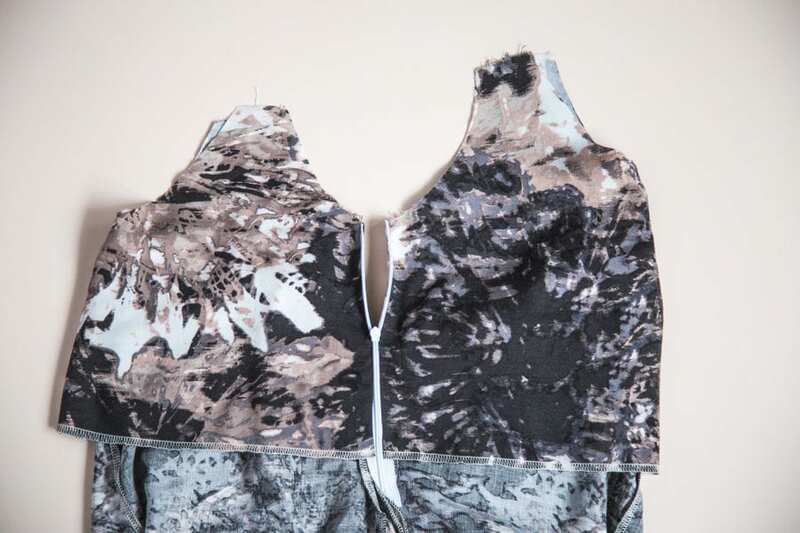 Repeat the same steps as above to secure the back lining to the back jumpsuit. Roll the zipper seam allowance towards the lining to properly match the armscye notches. 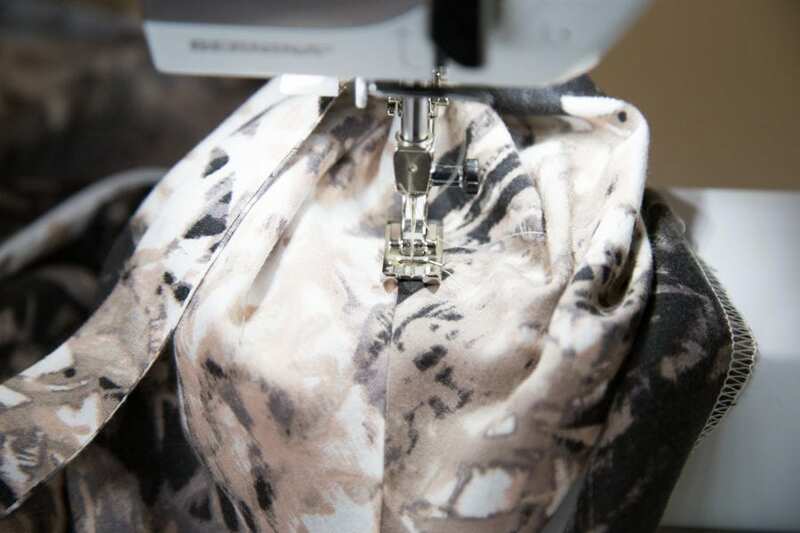 When the lining has been completely sewn to the jumpsuit, turn things right side out to make sure the straps are not twisted and there is no puckering. 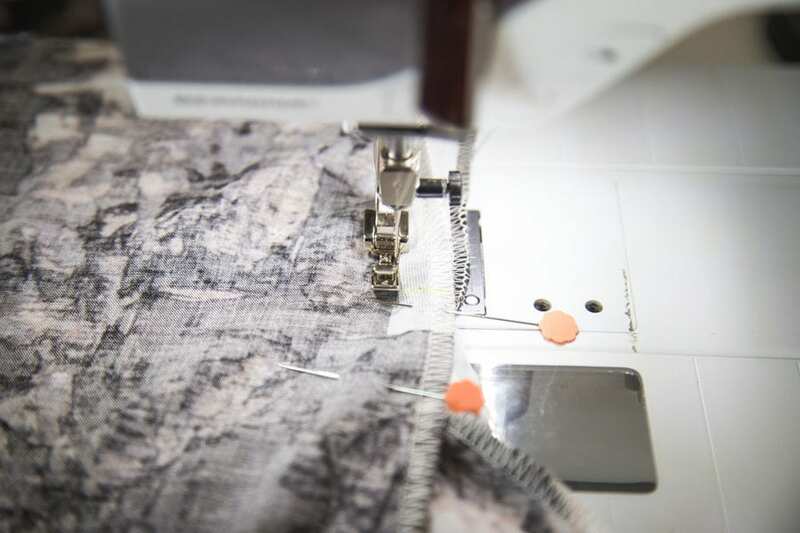 Once you have confirmed everything is sewn correctly, grade and notch the seam allowance so everything will lie flat when turned right side out and pressed. Be very careful not to trim too much of the corner at either side of the zipper. 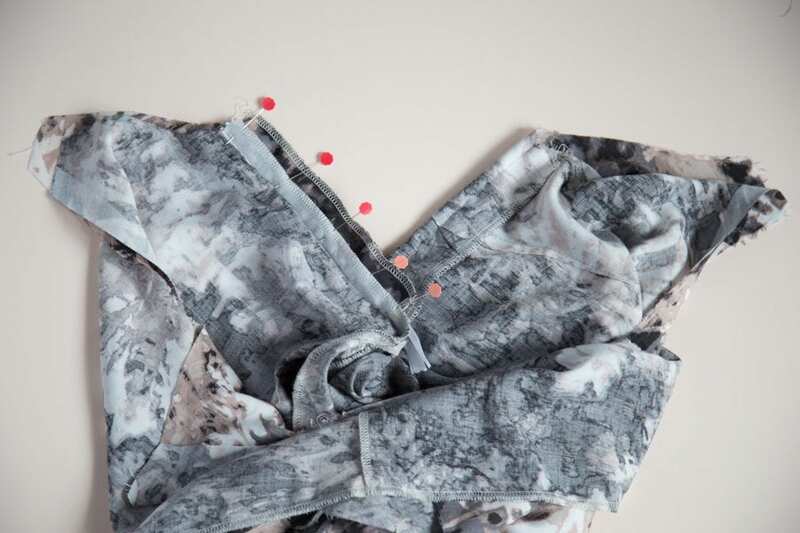 This area will experience a lot of wear and tear as you open and close the zipper each time you wear your jumpsuit. 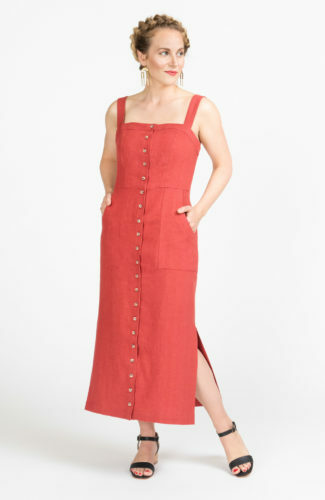 Instead of trimming down the excess zipper tape, try trimming just the jumpsuit and lining seam allowances. You may have to undo a few stitches. 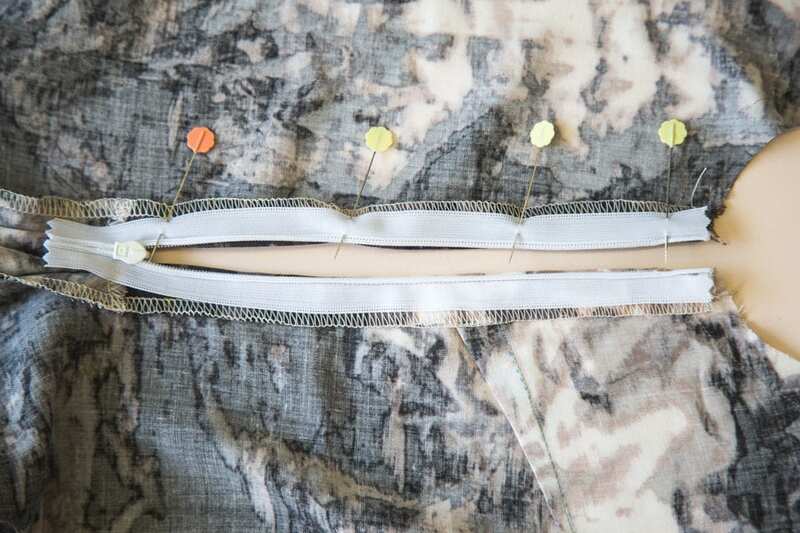 Using a pair of tweezers, fold the zipper tape and seam allowance down in a 45 degree angle. Keep this corner pinched in place with your tweezers as you turn everything right side out to keep it in place. Voila! A nice, precise corner! 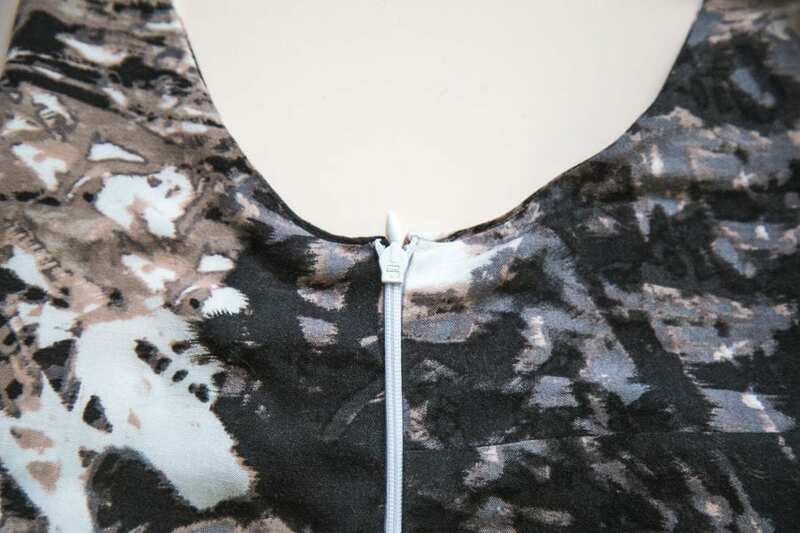 Because the side seam allowances were rolled around the zipper, you should have a clean finish on the inside too! 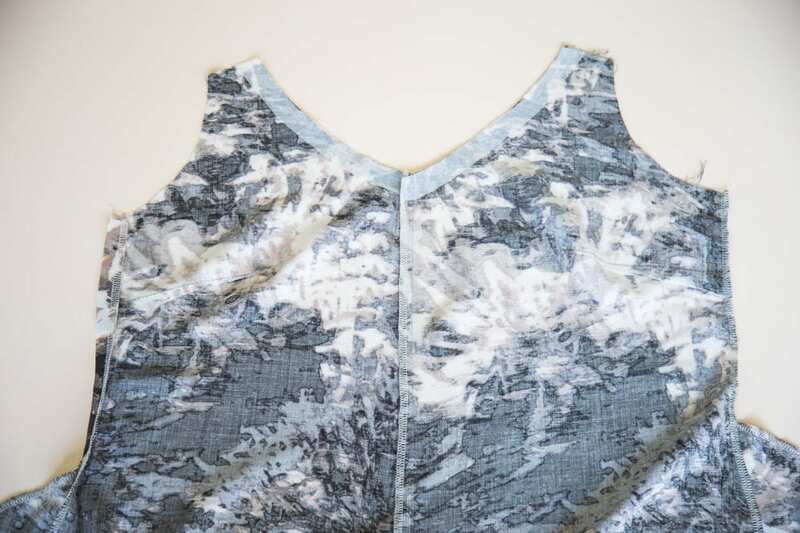 The last step is to understitch the lining to the seam allowance around the neckline to prevent it from peeking out. 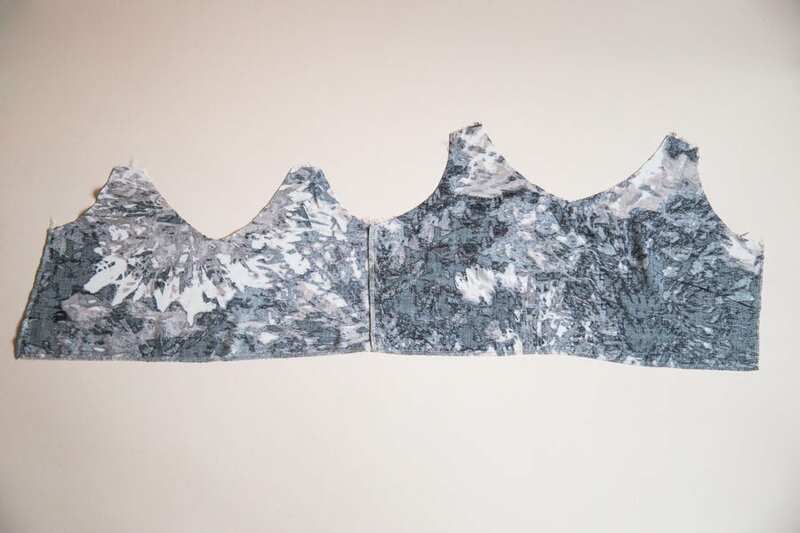 It will be impossible to sew around the neckline and armscyes in one pass because of the straps. Start and stop stitching an inch or two away from either side of each strap. 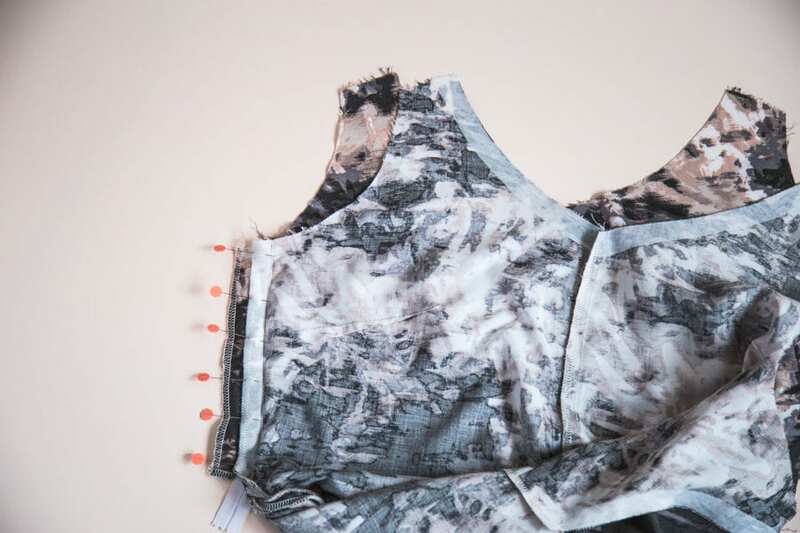 If understitching isn’t your game, you can topstitch all the way around as an alternative. 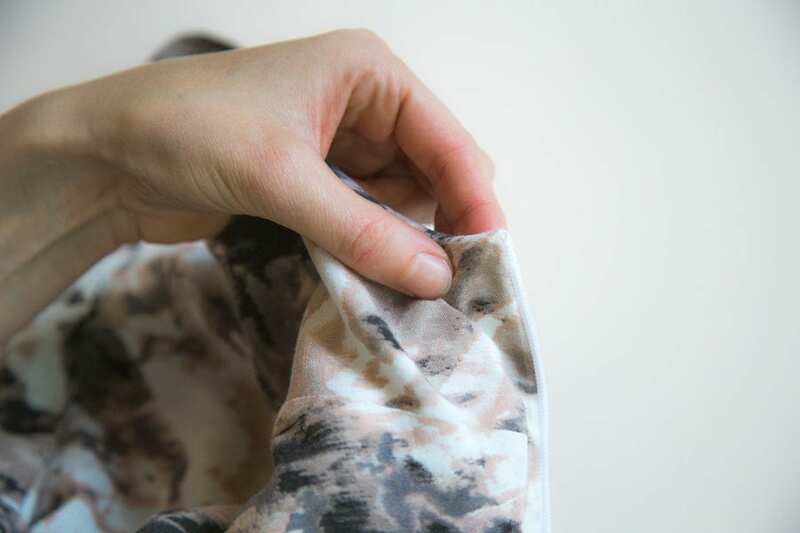 You can also handtack the lining to the seam allowance of the jumpsuit at center front, center back, and the right side seam to help keep the lining in place. Hopefully you’ve got the hang of installing invisible zippers now! In some ways they are even easier than regular zippers, since the invisible zipper foot grooves do most of the work for you!